Interested in teaching? Please watch this short video clip from our main accredited provider KMT to help you in your decision making. THE PARTNERSHIP – WHY TRAIN WITH US? Saint George’s Church of England School is a Lead School for Aletheia Anglican Academies Trust, a School Direct and Hub Training Centre for Kent and Medway Training (KMT), our Initial Teacher Training (ITT) partner http://www.kmtraining.org.uk/. Twitter: follow @AletheiaAAT for our latest updates on the status of our training vacancies, open days, taster days and general information on education. Instagram: follow us on aletheiaaat for updates and photos of our recruitment fairs, events and school based work experience. In partnership with Kent and Medway Training, we endeavour to ensure that trainees have the relevant, quality exposure to both the practical and theoretical elements of the course and have the opportunity to network regularly with others embarking on the same subject studies at other training institutions. As well as our work with KMT we also host and train trainees from Canterbury Christ Church University http://www.canterbury.ac.uk/. Last year all our School Direct Associate Teachers and trainees successfully completed their placements and found employment in local schools and some within the partnership. We pride ourselves on our 100% success rate. In addition to that we had 100% success rate on all our NQT induction year. This is as a result of delivering a high quality post training programme of support in the first year of all our qualified teachers building on all their strengths and areas for further development since gaining QTS. We are pleased to be able to offer salaried and non-salaried training placements to successful candidates in the following subjects and sectors. You will need to apply through UCAS – search for Aletheia Anglican Academies Trust. SCHOOL EXPERIENCE PROGRAMME – TEACHING TASTER DAYS If you are interested in a teaching career and would like to experience life in a secondary school environment, then sign up for one of our taster days through the School Experience Programme. You will be given the opportunity to observe lessons, meet our students and our current trainee teachers as well as gain real experience of what it is like to train and teach at Saint George’s School. We can also facilitate taster days in any of the schools within our hub. Frist of all, simply register with School Experience Programme before you can get into the school experience programme. For further support once you have registered and for forthcoming dates of taster days at Saint George’s, email Nikki Shibli (SHIBLIN@sgsce.co.uk). TEACHING AS A CAREER – SCHOOL DIRECT https://getintoteaching.education.gov.uk/why-teach School Direct courses are designed by groups of schools – with a university or a SCITT – based on the skills they are looking for in a newly qualified teacher (NQT). The schools recruit you as a trainee onto their School Direct course with a job in mind just for you. This is a popular choice for those who hope to secure a role in the network of schools where they train. School Direct (Salaried) If you’re a graduate and have been working for around three years in any career, School Direct (salaried) courses are available for you. On this school-led option, you’re selected directly by the school or partnership of schools you apply to – and you’ll earn a salary during your training. Schools recruit you as a trainee with a job in mind just for you. School Direct (salaried) courses normally take a year to complete. This is a great choice if you want to stay in the world of work, as you’ll be employed as an unqualified teacher during your training while you learn ‘on the job’. But that doesn’t mean you’ll be thrown straight in at the deep end or expected to work things out for yourself. As a School Direct (salaried) trainee, you’ll be surrounded by experienced teachers and mentors to support you from the start. The school you’re with won’t ask you to teach classes unsupported until they think you’re ready. The principles of academic rigour on School Direct (salaried) are the same as on university-led courses, too. School Direct courses generally last a year and all result in QTS. Most School Direct courses also include a postgraduate certificate in education (PGCE) and/or master’s-level credits – you can check the exact details of individual courses on the UCAS Teacher Training site. Your training cost to achieve QTS is covered by the school. The amount you earn will be dependent on the school you train in and the subject you’re teaching. 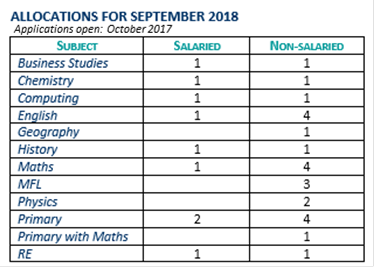 This year, a number of schools are offering an enhanced salary of up to £25,000 to trainees in maths and physics – you should check with the school before you apply to see if they are offering this higher rate. Your work experience does not have to be from a career in education, but generally applies to the years following graduation. Please ask the schools you are interested in applying to about their recruitment arrangements. In addition, some schools may accept applications from high-quality candidates with fewer than three years’ work experience. Remember that generous tax-free bursaries and scholarships of up to £30,000 are available to train to teach some subjects. This may make better financial sense to you than a School Direct (salaried) course, where you’ll be paid and taxed as an unqualified teacher. Have two block placements in different partnership schools. Work closely with a school-based trained subject mentor and professional tutor. Have additional subject specialist input. Attend regular training sessions about broader educational issues (professional studies) where you meet and work with other training teachers on the School Direct Programme. Be awarded Qualified Teacher Status to teach Key Stages 3 and 4 on successful completion of the programme. If you are considering returning to teaching, the transition may be much easier than you expect. Whether you left to bring up a family or explore a different career, there is a lot of support available to help you become one of the thousands of teachers who come back to the profession each year. Find out about getting back into a career where you can make a real difference every day. Email Nikki Shibli (SHIBLIN@sgsce.co.uk) for more information and an informal meeting. School Experience Programme: School experience is essential if you’re interested in becoming a teacher. Before you apply for your training, you’ll need to gain as much experience in the classroom as possible in order to strengthen your application and prepare you for potential interviews. There are also lots of ways to arrange school experience independently at both primary and secondary level. You can use this section to find out more, and update your profile’s progress bar if you’ve already got some experience under your belt or have a placement lined up.